Capture HAR files from a headless Chrome instance. Under the hood this module uses chrome-remote-interface to instrument Chrome. Alternatively this module provides a simple API that can be used to write custom applications. See the command line utility source code for a working example. Start the loading of a batch of URLs. Returns an event emitter (see below for the list of supported events). urls is array of URLs. If this hook resolves to a value then it is included in the resulting HAR object as the value of the _user key of the this URL's page object. Emitted when Chrome is about to load url. index is the index of url in urls. urls is the array passed to run(). Emitted when Chrome finished loading url. index is the index of url in urls. urls is the array passed to run(). Emitted when Chrome cannot load url. The Error object err contains the failure reason. Failed URLs will not appear in the resulting HAR object. index is the index of url in urls. urls is the array passed to run(). Emitted when all the URLs have been processed. If all the URLs fails then a valid empty HAR object is returned. har is the resulting HAR object. 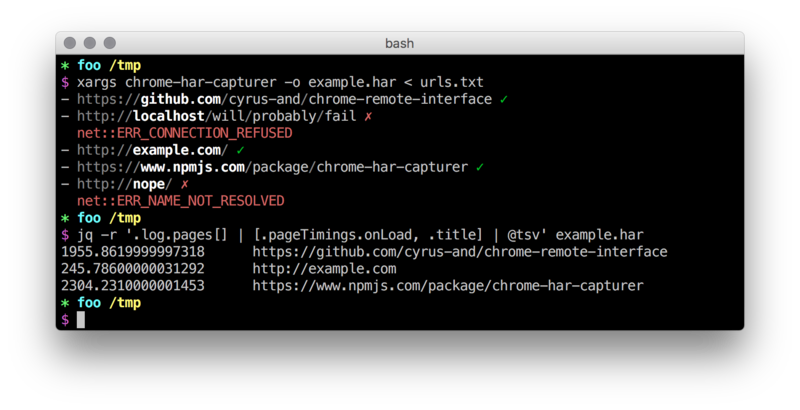 Generate a single-page HAR from an array of raw events that comes from the Chrome Debugging Protocol. Returns a Promise that fulfills to the generated HAR. content: if true also expect the requests body. Defaults to false.